By means of a perturbation method the average scattering cross section of an ensemble of randomly oriented irregular particles is calculated; the material of the particles is perfectly conducting, and their deviation from the spherical shape is assumed to be small. The novel idea consists in pursuing a statistical approach: instead of an ensemble, a single particle with statistical surface irregularities is considered; this approach resembles some well-known methods for treating scattering from rough planar surfaces, e.g., the Rayleigh–Rice method. It turns out that the surface autocorrelation function and the sizeparameter uniquely determine the average scattering behavior of the particles. The scattering cross sections result as expansions in generalized spherical functions, which are of importance in the theory of radiative transfer of polarized light. 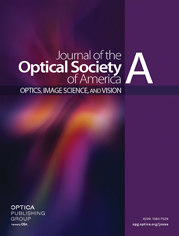 Limiting cases of long and short wavelengths are discussed and are shown to agree with results found in the literature.